Well, it's taken me just a bit to get around to this... Busy doesn't even begin to describe my life lately! 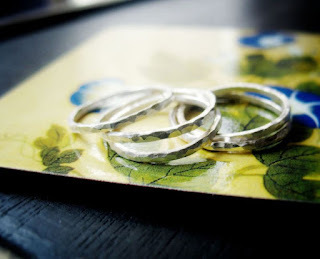 But, I've got my first stacking rings finished and they'll be in the shop later today. These stunning little stackers are called Prism, for all of the little facets adorning their surface which reflect light beautifully. I've also been experimenting with copper lately and discovering some sweet new finishes... Some of this inspired by the last metals class I attended taught by the extremely talented Nancie Roark. We played around with lots of different techniques and equipment (she's got all the stuff I WISH I had right now! ), and I'll be posting some updates about those later on.